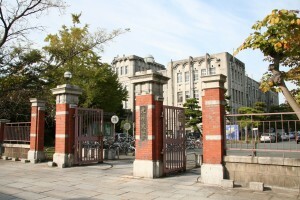 Kyushu University (Kyudai), Western Japan’s premier higher education institution, also boasts the best Asian connections of all the nation’s seven flagship ‘national universities’. Located in the city of Fukuoka – consistently voted amongst the world’s most ‘livable’ cities – it is closer to Shanghai and Seoul than to Tokyo. The island of Kyushu is the crucial bridgehead between the Japanese archipelago, mainland Asia and the wider world – in the 19th century, it was here that Japan’s transformation into a modern, industrial nation began. And today, Fukuoka thrives on its links with China, Korea and South-east Asia. The city hosts an annual ‘Asia month’, and awards the prestigious ‘Fukuoka Prize’ for outstanding contributions to academia, culture or the arts relating to Asia. Designated in 2014 as one of 13 Japanese universities tasked with leading efforts to internationalize higher education, Kyudai has made enhancing ties with mainland Asia central to its strategy. Already a hugely popular destination for Asian students, the university has well-established Japanese and Asian Studies programmes for international students (Japan in Today’s World and Asia in Today’s World). We boast a wealth of inter-disciplinary expertise on Asian history, politics, sociology and culture – and on scientific research in Asian contexts. Regular open seminars on Asian Studies enable scholars, students and members of the public to learn about and discuss work by our own faculty, and by visiting academics from around the world. Building on these strengths, we are now planning new interdisciplinary courses and programmes in Asian Studies, taught in English. This website is designed to provide easy access to information on all our Asia-related courses, expertise and events – for existing or prospective students, academics and overseas visitors.